You don’t have to wait for a special occasion to host a paella party. In Spain, most families get together every Sunday around a paella pan to chat, laugh and have a few drinks. What’s fun about making paella is that it’s a spectator sport. Paella takes on average an hour to cook so there’s plenty of interaction while everyone stands around getting hungrier and hungrier. 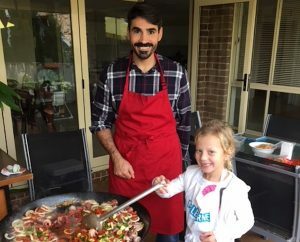 It’s also a great opportunity to get the kids involved as there are a few different steps that they can help out with – Food Adventura chefs are always happy to teach anyone who is interested! We hosted a paella party at our house recently which was a wonderful experience. We have one daughter who loves cooking and Bruno was more than happy to explain the spices (saffron and paprika, stir through the stock, add ingredients and help with seasoning. When the paella was ready – a stunning looking seafood paella studded with mussels, baby octopus, prawns, calamari and fish – we squeezed in around the dining table and shared the dish. And the verdict? Our girls loved the prawns (they’re fussy eaters) and my husband, 16 month old son and I loved all of it. It was great to see how easy it was to set up and clean up, and a wonderful opportunity to spend some time with our family and new friends. Food Adventura chefs pre-prepare everything so that when they come to your house, they don’t need to take over your kitchen. All the ingredients are ready to go, and the seafood is Cryovaced so there’s no mess. The chefs bring their own paella pan, utensils and gas bottle, and all the ingredients are packed into an Esky so it’s easy to set up anywhere. So there you have it – a fun idea for your next family gathering or group get-together that is child-friendly, affordable and super easy to clean up after. To organise your paella party, click here for more information or to speak to the team.